I feel awful. 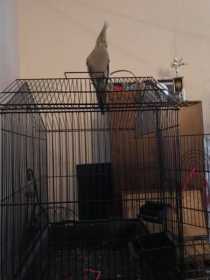 My female cockatiel Pearl must have flown over my head and outside. I saw her fly when I came in from taking my dog potty. I didn't see her go outside, but I can't find her. No I'm not blind but I wasn't paying attention. My conure had landed on the floor at the same time I looked at him. Because he is known to chase my dog.